This post is part of my personal challenge to bake my way through all the challenges of the Great British Bake Off. The challenge below is the technical challenge for week three (bread week) of series two: make Paul Hollywood’s focaccia. I always like it when one of the bakes I do for this slightly crazy challenge is savoury. I do have a strong sweet tooth but sometimes it’s nice to be able to bring one of my baked goods in to lunch for work or have it as a non-sugary snack. 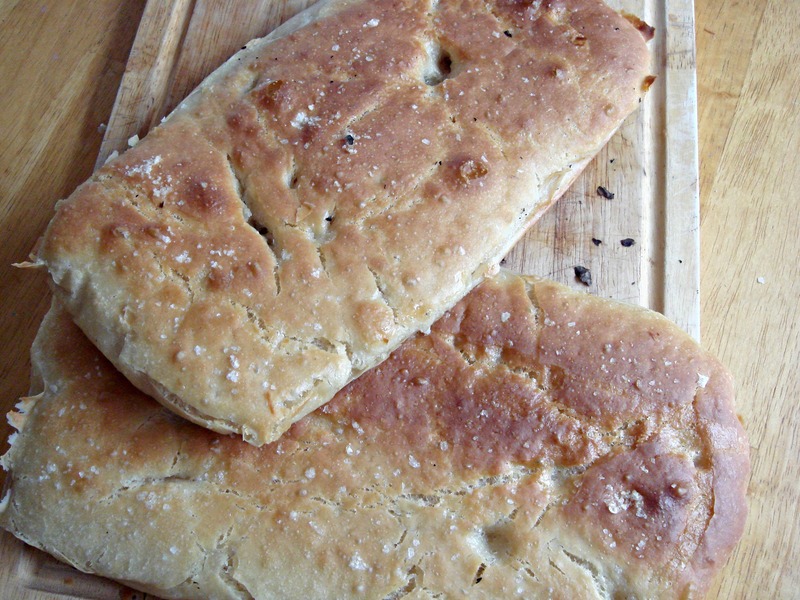 So, Paul Hollywood’s focaccia, one of the technical challenges in series two. What I primarily remember about this challenge is that the dough was very wet and some of the contestants struggled with its liquid nature and added more flour. The trick, as Paul H articulated in the episode itself, is to add the water gradually, so that the flour slowly absorbs it, rather than all it once – when it just becomes gloopy, sloshy paste. The recipe does specify some turning and folding and honestly, the dough was so liquid that it was very difficult to follow through as it just all flowed back into one. I went through the motions of the actions required, however, and miraculously the dough did over time develop a structure and got a bit more body. It was certainly never as solid as the more conventional bread doughs which can be kneaded and pummeled, though, so don’t expect that. Sloppy structure aside, this recipe was exceptionally simple – lacking even the sprigs of rosemary which I thought were obligatory (despite the photo on the BBC website where I found the recipe, the herbs are simply listed as an option). The resultant breads were slightly oily to the touch – I’m not sure if they weren’t, strictly speaking, slightly oilier than they should have been – with a chewy crust and soft, tender, well-flavoured insides. I served them as an appetiser for a dinner party I was holding, with more olive oil for dipping and balsamic vinegar. They went down well. However, my favourite focaccia – although definitely not simple and requiring an overnight rest – is Peter Reinhart’s – though skip the garlic powder specified as it adds little but acrid harshness. You will need two large baking trays – I used brownie trays similar to this one. Place the flour, salt, yeast, olive oil and 300ml of the water into a large bowl. Gently stir together with your hand or a wooden spoon (I’d say hand is easier, and it’s better if you can feel the changing texture of the dough) to form a dough. Knead the dough in the bowl for five minutes, gradually adding the remaining 100ml of water. I found that the dough went from slightly dry to extremely sloppy over the course of adding the water. Stretch the dough by hand in the bowl, if you can – I just picked up flabby tendrils and slapped them around a bit, tuck the sides into the centre, turn the bowl 80 degrees (what?! I turned it 90. What is 80 degrees by eye anyway!) and repeat the process for about five minutes. Over the course of this time the very liquid dough will gradually get a bit of structure and be easier to handle, though it’s all relative. Tip the dough onto an oiled work surface and continue kneading for a further five minutes. I used an oiled dough scraper for this as it was still basically a dough puddle. Return the dough to the bowl, cover (I prefer clig film) and leave to rise until doubled. Line two large baking sheets or brownie tins with baking powder. Tip the dough out of the bowl and divide over the two trays. Flatten the dough by gently pushing it into the corners of the trays. Leave to prove for one hour, loosely covered. When ready to bake, preheat the oven to 220C. Drizzle the loaves with olive oil and sprinkle with the fine sea salt. Bake for 20 minutes. I tried that same recipe after seeing the episode – I was so surprised by how much the contestants struggled, and wanted to try it myself. Yours looks nice – mine wasn’t quite such a success! They did seem to struggle – I think if you throw all of the water in at once, as some of them did, it’s difficult to work with.